Bill Buckley has now unmasked himself as a cowardly, anti-American ally of Al Qaeda. He wants to wave the white flag to terrorists, and has sabatoged the Commander-in-Chief’s war effort by declaring it a failure. Shouldn’t we bring criminal charges against Buckley, along with demands that he be hanged? On what ground can any of the Bush followers who have long equated opposition to the war with subversion and treason -- and who branded Howard Dean a traitor for a statement identical to the one Buckley made -- oppose those efforts? "He thinks we're not safer by removing a homicidal maniac," Lieberman said in a speech. "The fact is that Governor Dean has made a series of dubious judgments and irresponsible statements in this campaign that together signal that he would take us back to the days when we Democrats were not trusted to defend our security." "Dubious judgments?" That's funny. In light of Joe's continuing brainlock on this issue, we need to ask the question Greenwald asks in another must-read post at Crooks and Liars: whose judgment on the Iraq war is entitled to respect here? If Democrats are ever going to be credible on national security - which we absolutely must be, and which we are currently becoming in spite of Lonely Joe - we need to continue to show how our collective judgment is deserving of more respect, and how our leaders are deserving of more authority than those who have failed us. Joe Lieberman is among those who have failed us. He weakens both our party and our nation on matters of national security. And there should be an official announcement of the campaign thrown in there somewhere too. As well as, I'm sure, many other events. Check the campaign site for updates, and contact the campaign if you are interested in hosting an event. Or get involved with your local Democratic Town Committee if you live in CT (here are the monthly DTC meeting dates listed by town). Jane from Firedoglake has been on fire putting Lieberman and NARAL and Planned Parenthood on the defensive on Lieberman's vote for cloture on Alito, in light of South Dakota's recently passed abortion ban. Read both this post and this one from HuffPo. Ned will be speaking at Yale in front of the Yale College Democrats this Monday, Feb. 27th. Don't know if the event is open to the public. Live around Groton, Fairfield, or Torrington, and want to host a house party/meet and greet event with Ned in the next couple of weeks? Read this. Lieberman and Dodd sat down for an joint taped interview on Wednesday that will air on WTIC-61 this weekend. "I have known him for 20 years and I have liked him for 20 years and I am ready to help," he told the Greenwich Citizen. "What will you do?" Blanche was asked. He answered: "Whatever Ned tells me needs done, I'll do." Folks huddled around Lamont seemed of a like mind. Lamont appears to exude charisma. William F. Buckley and Joe Lieberman go back. Way back. Hell, they're still tight. One could say Joe owes his entire 18-year run in the Senate to the support of Buckley and the radical right, who possessed a fierce hatred of Weicker and always knew Joe, though a Democrat in name, would never turn his back on them. And one would be correct. So Lieberman's political godfather joins the ranks of those who "undermine presidential credibility at our nation’s peril". At this rate, the only two people left defending the president's policies will be Joe Lieberman and Laura Bush. The preference for the opposition party is small, but the fact that Democrats are even competitive on the national security front is startling. In Election 2002, the President guided his party to regain control of the Senate based almost exclusively on the national security issue. On Election Day that year, just 23% rated the economy as good or excellent, but the President's Party still emerged victorious. This could be the turning point we have been waiting for for years to finally paint Republicans for what they are: weak on national security. But where was Joe on this issue? With Sen. Clinton, Sen. Schumer, Gov. Pataki, Sen. Menendez, Gov. Corzine, Rep. King, countless other politicians, and 64% of the American public? No, he was apologizing for Bush, as usual. It's a hard habit to break, I know. With these numbers, expect real Democrats to smell political blood and continue to push the issue. They would be fools not to do so, both on substance and on politics. Will Lieberman stand with Democrats, Republicans, and 64% of the American public? Or will he continue to stand with the President? would you slam the door? for a war or two. hurt the troops when you criticize. Every six years we can have elections in Connecticut, if the field is cleared. "I have a different stance than Joe on the war," said Robert Proto, President of UNITE-HERE Local 35 in New Haven. "It's clear many of our folks don't think the direction we're taking [in Iraq] is right, especially because we have no concrete exit plan. But our culture is to endorse folks who have stood side by side with us." Another large progressive union, the Service Employees International Union, hasn't started its deliberations about this primary, though two of its largest locals already endorsed John DeStefano for governor. Lieberman's support for the war has caused enormous hurt for working families, due to federal budget cuts necessary to pay for the occupation, according to Paul Filson, director of SEIU's state council. "We're sympathetic to a lot of Lamont's positions but we're not in a hurry to jump into a primary race," Filson said. It is in labor's interest - as much as it is in every Connecticut Democrat's interest - to ask which candidate would do a better job by them. Loyalty should never be a one-way street. 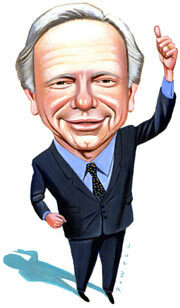 The last time Joseph Lieberman faced a primary was in 1970, when he made his first bid for a state Senate seat. In that race, Lieberman was the challenger, going up against an incumbent. This year, the roles are reversed as Lieberman, a three-term incumbent U.S. senator, faces a primary challenge from Greenwich businessman Ned Lamont. "I think people want a choice," Lamont told a group of about 75 people Wednesday night, at a forum sponsored by the Lower Connecticut River Forum. "I think people want a good debate, a civil debate, and they want to know how do we get ourselves out of this mess." Lamont will declare his candidacy next month, hoping to ride an increasing wave of opposition to the war in Iraq and Lieberman's support of it. "I think we all know that staying the course is the wrong answer," he said. Lieberman has never had to defend his record to Democrats alone. He's always won elections with the help of his base conservative support among Republicans and Independents. And while Iraq isn't the only issue galvanizing Lamont's support within the party, it is the biggest one. So given recent events in Iraq as the situation sprials ever downwards (even Bill O'Reilly is jumping ship), perhaps Joe would like to rethink and restate his position on the war as he spelled out in a Wall Street Journal op-ed three months ago (entitled "Our Troops Must Stay"). "I've spoken to Joe Lieberman and he knows he's out there alone. I mean, literally alone. Joe is a fine man, he has strong feelings, but he's just alone. Even Republicans don’t agree with Joe." Note: this is a re-post of a diary entry posted at Daily Kos earlier this month, referencing Joe Lieberman's chat with his good friend Sean Hannity on Feb. 10th. Lieberman's interview with Hannity was an amazing example of the uber-Navel-Gazing Democrat gone off the deep end. Vilsack and Bayh are amateurs compared to Joe. Going through the interview, time and time again, Lieberman plays an even more emasculated Alan Colmes, asking his interlocutor to set the terms of debate, and, unlike Colmes, shying away from any hint of disagreement with Hannity even when the lines between him and Lieberman (even as a conservative Democrat) are clear. HANNITY: I'm good. Now listen, before we get into all the stuff that we need to talk about, there's a lot of news here. I need to know, yes or no, do you want my public support, do you want my endorsement, do you think that hurts your re-election efforts, do you want me to come out in opposition of you, I want to do what's in your best interests, you gotta tell me what you want me to do. HANNITY: (Laughter) I'm thinking... I'm thinking Hannity Conservatives for Lieberman and I'll do a big fundraiser in Connecticut. LIEBERMAN: Yeah, yeah. Let me just say, I appreciate your friendship, and I appreciate your support. Really. HANNITY: So you want my endorsement? Lieberman says he is happy to accept support from all parties, which in theory is fine. In practice, he built his career by taking out a Republican senator who was very popular with liberals and moderates in Connecticut 18 years ago, and then being the most conservative possible choice for a frightened presidential candidate in Al Gore who was trying to distance himself from his boss. But Lieberman is less popular with Connecticut Democrats than he is with Connecticut Republicans. He must know how incredibly vulnerable this makes him to a primary challenge, where Republicans - like Buckley and Hannity - can't vote for him. HANNITY: ... by the way, I was mad at you at Alito, and one day I'm gonna pull you aside, and I believe in my heart, I really believe in my heart that if the president really needed your vote, you would have been there. HANNITY: Alright, you don't want to answer that publicly, do you? LIEBERMAN: (Laughter) Cause I voted no. LIEBERMAN: But I did vote against the filibuster cause I thought that, you know, it was time to move on. Absolute wrong answer. Right answer for a Democrat: "I voted against Alito because of concerns A, B, and C. Period." Project strength. Stand behind your convictions, if you have any. Instead, he cozies up to Hannity, trying to show him how "good" a Democrat he's been by voting against the filibuster. HANNITY: Yeah. But are you concerned at all about... that your political situation... you are gonna have a primary it looks like? LIEBERMAN: Well, yeah, I mean it's basically from folks in the Democratic party who are obviously angry at me about the war, and also don't like the fact that, you know, sometimes I work across party lines, but that's because that's what you do to get something done and, you know, I just don't think every issue has to be taken as a partisan issue. But I'm taking it... there's not a declared candidate... there's a guy from Greenwich who's looking at it, and I'm taking it seriously. It's a privilege to be a United States senator and it's nothing, you know, that comes as a grant, so you gotta earn it every time around and I'm ready to go out and fight for it. Two things here about how Lieberman will deal with Lamont. (1) He will try to paint him as purely anti-war and anti-bipartisanship. I don't know how this will sell in a Democratic primary in a state that is overall anti-war and pro-Democratic party. (2) He will call him an elitist "from Greenwich" and hope that depresses turnout. HANNITY: Look, like everything else, Senator... I mean, I actually have a whole series of quotes here in front of me... you know, Robert F. Kennedy Jr., the day after the hurricane hit, he blamed Bush and the CO2 gases and the not supporting the Kyoto accord. You have Paul Begala said, well the money was spent to fund Iraq. Ted Kennedy said, Bush is the one who poisoned the air and water. Here's what bothers me about this whole thing, the government made terrible mistakes. HANNITY: But for 35 years, New Orleans knew this was coming. They had a thousand schoolbuses sitting five feet away from them, and the governor and the mayor didn't have enough sense to go put a key in it and get a thousand drivers and help these people out that needed help. What about the person, Senator, who is trying to scapegoat RFK Jr., Paul Begala, Ted Kennedy, Gov. Blanco, and Mayor Nagin? The person on the phone with you right now, scapegoating and tarring five major figures in your party? You don't care to perhaps, point that out politely, much less defend one or any of them? Why do you call yourself a Democrat if you fail to defend your party? HANNITY:...And, you know, Karl Rove said that Democrats have a pre-9/11 worldview, and he said, it doesn't make them unpatriotic, but it makes them wrong. HANNITY: He believes, profoundly consistently wrong. And I think the latest example of this is, we can kill members of Al Qaeda, but we've got Democrats up in arms over the idea that if Al Qaeda calls into the United States from an outside country, that, boy, we'd better get a court order to listen to them. It's absurd to me. LIEBERMAN: Yeah, here's where... this may not be a big disagreement... I totally want those programs to go on. I think in America we don't like to give authority without some minimal screen. And you know, it was very interesting at the Judiciary Committee hearings this week, you had a bunch of Republicans, who are I'd say conservative Republicans, like Lindsay Graham and Sam Brownback, saying we've got to figure out how to work on this. Nobody should want to stop this program, nobody should even want to impede it, cause we want to be listening to Al Qaeda-related phone calls, we want to be reading their emails, but I think we want to work with the administration to come up with some kind of promise, not for, almost for the future, that in our country, you know, you need some kind of court approval from a secret court, FISA court, or something else. And I think we can work this one out. This is really an unnecessary debate, and and unnecessary fight and it distracts us from the war on terrorism. "Not a big disagreement," "minimal screen," "unnecessary debate"... these are the words of someone who doesn't want to talk about this issue for fear of some non-existant political backlash. You may not think this is a big issue, Senator, but the American public does in poll after poll. Sen. Graham and Sen. Brownback and other Republicans have shown more backbone than Sen. Lieberman on this. Pathetic. And when you call this an "unnecessary debate," perhaps you'd like to point out a minor fact like that it was president breaking the law that led to this little debate?And not make it seem like it's the Democrats that are debating "unnecessarily" here? OK, maybe next time. HANNITY: And it goes on, it starts listing some of the Democrats that have become the most outspoken. And we saw, for example, during the Alito hearings we saw Ted Kennedy and Biden and Chuck Schumer. Hillary Clinton is a loud voice for the Democratic party these days, as is John Kerry. We saw, for example, the way the president was treated down at Coretta Scott King's funeral, by Jimmy Carter. Do you fear that the Democratic party has really been co-opted by a pretty hard-left element? LIEBERMAN: Well this is the great challenge to us. I mean, if Democrats ever want to get back in power, they're gonna have to move back toward the center, and are gonna have to reassure the American people on the baseline question, which is what government, particularly the federal government, is about before anything else, which is security, that Democrats will use the power of our government to protect people's security in a dangerous age. Unless we do that, the public's never gonna listen to us on everything else, including a lot of the stuff on which I think they agree with Democrats, like education, healthcare, et cetera. First, never refer to Democrats as "they." Unless you aren't one. Second, I agree with Sen. Lieberman that the Democratic party needs a positive program and message on National Security. But Lieberman thinks this program should be Bush's program. Bush's/Cheney's/Lieberman's program has failed on all levels. We are not safer. This is why Hannity loves you, Joe. Because you help validate a failed program and help impede the Democratic party from moving to a real, positive National Security message. You enable failure on issues of security for your party and your country. HANNITY: You know something, it's amazing, I say that on this program all the time, Senator Lieberman. No, but you know something, if they would listen to you, you would have a real opportunity to get back into power. But thank god they're not listening to you. HANNITY: Your voice is not being heard. I don't anticipate it's gonna be heard in the future. And the only hope for you is to just leave the party, and become a good cons... see, I've, I'm not even, I'm re-registering as a conservative. I'm a Reagan conservative. So you can join the conservative movement with me, and we'll start a third party. LIEBERMAN: America may be ready for a third party, Sean. An independent party. HANNITY: Last question. If you ever want me to do anything, for you and your re-election, I think we ought to have Conservatives for Lieberman, a big fundraiser in Connecticut, and if I could ever do that, I'd make it the biggest blowout celebration ever. So it's clear: Lieberman's main goal in this interview, as in so many others he's conducted, was to continue cozy up to the radical right. They got him elected in 1998 and fund his campaigns even today. They are his base, not moderate Democrats. While his responses to Hannity about forming a third party, or showing up at a "Hannity Conservatives for Lieberman" fundraiser, may have been in jest, I am not at all convinced there was not some real kernel of truth to them. Chuck Schumer, Hillary Clinton, Robert Menendez, Bill Frist, Denny Hastert, Pete King, Susan Collins, the vast majority of conservatives and liberals alike, ... even Joe's best friend Sean Hannity. All have voiced serious opposition to the UAE ports deal which would give control over our critical national infrastructure to a company owned by a dubious (no pun intended) foreign government, one which recognized the Taliban and has yet to recognize Israel. Even those who aren't explicitly opposing the deal are at least calling for a delay to closer investigate the deal, and are furious with Bush for his threat yesterday to use his first veto to kill legislation intended to scuttle the deal. One of the few legislators to come close to defending the transaction was Senator Joseph I. Lieberman, Democrat of Connecticut, who is considered a security hawk among Democrats. He told ABC News that he was "not yet" prepared to try to block the sale. He noted that many port terminals in the United States are foreign-owned. "I worry more about the failure to invest in port security" - to improve the ability to detect smuggled weapons of mass destruction, for example - "than I worry right now about this sale," Mr. Lieberman said. I'm not going to waste any more time hammering on Planned Parenthood and NARAL except to say that they do not get it. Pro-choice in this country is going down, all because of people like Joe Lieberman. It will not survive another vacancy on the Supreme Court filled by George Bush and passed by this Senate. 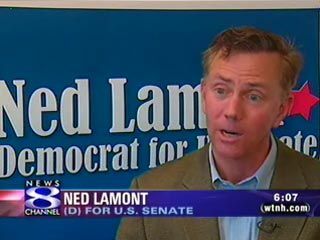 Redd and I are adding Ned Lamont to our Act Blue page. Ned Lamont would not have voted for cloture on Alito, and he is a solid pro-choice candidate (I will hopefully have more on this tomorrow). If you care about pro-choice in this country please give to Ned Lamont. Give til it hurts. It saddens me terribly to say this because I have been a big Planned Parenthood and NARAL supporter all my life but until they can show that they understand what is going on and the way this war is being waged they do not deserve your pro-choice dollars. What's more, their endorsement could swing the election in a heavily pro-choice state, and they are under tremendous pressure to endorse Lieberman. Please contact both NARAL and Planned Parenthood and tell them to support Ned Lamont and prove that they understand that people like Joe Lieberman and Lincoln Chafee are pro-choice only when it doesn't count. When Alito was sailing through a potential Democrat-led filibuster, "Where was Joe?" You were right about one thing, Joe. It is time to move on. Over at ConnecticutBlog, ctblogger has posted a description, along with photos and video, of Ned Lamont addressing the Southbury Town Democratic Committee last night. The clip is a peek into a rapidly emerging and powerfully concise campaign message, and Lamont already seems a much more focused and practiced campaigner than he was even a few weeks ago. On a litany of issues, beginning with Iraq, but extending to warrantless domestic spying, the Schiavo case, the energy bill, judicial appointments, and fiscal policy, Ned asks one simple repeated question of the incumbent: "Where was Joe?" The answer, inevitably on almost every point, is that Joe was firmly planted on the wrong side of every issue. If, as many have argued, 2006 is going to be a "change" election, then this message strikes me as a particularly cogent and potentially effective one... especially in a primary election where the incumbent has never previously had to defend his performance to the voters in his own party. 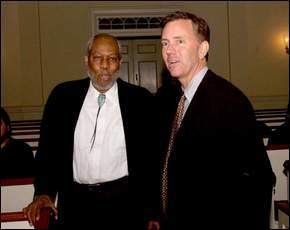 Lamont on WTNH: "We're A Go"
Lamont told me today there is no more doubt about his running. "Yeah, we're a go, Mark, we've been traveling all over the state, talked to hundreds of people, thousands have come to our website and they're really encouraging us to do it, and I want to do it," says Lamont. Lamont says opposition within the Democratic Party for Lieberman's strong position in favor of the war in Iraq has blossomed among activists. "They think the war is distorting our priorities, it's taking away from medicare, student loans and veteran's benefits. They blame the war." He says he knows Lieberman can raise a lot of money and is ready for the challenge but Lamont says he will spend whatever he has to, of his own money to get a campaign started. "I'm going to do enough to get us off to a credible start. Seed money, that's what I've told folks, we're going to get the best campaign staff in the state. We've got them on board now." This campaign will not be stillborn. A little about me: I am a resident of New York City who used to live in Connecticut and still spends a lot of time in the state, as well as a longtime (at least in blog-years) participant in the blogosphere (since before the 2002 midterm elections). My username ("thirdparty") reflected my personal politics quite accurately in 2002 when I first chose it: alienation stemming from intense frustration with the national Democratic Party, going back all the way to President Clinton's triangulation and Al Gore's tepid campaign in 2000. This frustration culminated with the disgraceful abdication of principle and duty by so many congressional Democrats who voted to support the Iraq War Resolution in the fall of 2002, followed by the loss of the Senate in the midterms. But due in large part to the blogosphere, my politics have changed since then. While I was never a koolaid-drinking supporter of Howard Dean, his campaign was inspiring for what it hinted was possible in terms of the potential of the netroots/grassroots. It nearly brought him the nomination, and then it nearly got John Kerry over the hump. November 2004 was devastating, and it took some time to recover. But I now considered myself a committed partisan Democrat, with a desire to change my party for the better. Which brings us to Ned Lamont. I believe all of the above is true, and I believe achieving all of the above is possible. For now, be sure to visit NedLamont.com to learn more about Ned's campaign, read this weekend's piece on the primary race in the Connecticut section of the New York Times, and read this great post on Ned by Matt Stoller of MyDD.